WBC heavyweight king Deontay Wilder is no stranger to controversy caused by his trash-talk, his sometimes gangster talk. Not too long ago, whilst a guest on a radio show, the unbeaten power-puncher raised plenty of eyebrows by stating how he “wants a body on his record.” Wilder said, in apparent seriousness, how he hoped to actually kill an opponent one day. Now, this week, Wilder has overstepped the mark again. 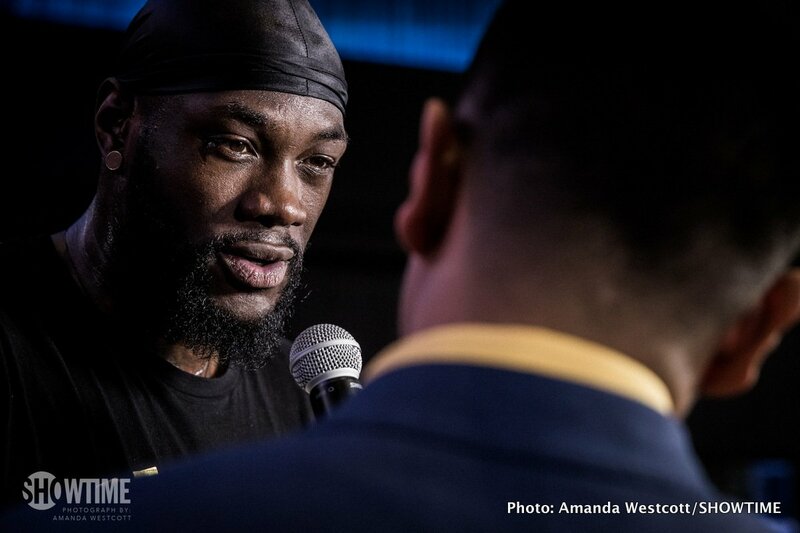 Speaking with Fight Hype, Wilder spoke about the possibility of him fighting Dominic Breazeale – Breazeale being a fighter he has had past issues with. Back in February of last year, after he defended his belt against Gerald Washington, Wilder got into it with Breazeale in the hotel lobby (Breazeale having fought on the Wilder-Washington card) and things turned physical. Breazeale says he was sucker-punched by Wilder and his team, this while he was with his wife and family. But if there was bad blood between Wilder and Breazeale before, it’s incredibly nasty now. The crass statement Wilder made when speaking with Fight Hype has understandably angered Breazeale enormously. “And if it do happen, aw, man, I’ma make sure he bring his son up on the stage to look the man in the eye that’s gonna cripple his daddy,” Wilder said of a possible fight with Breazeale and his gross prediction of what will happen. Wilder may or may not face Breazeale next, but this fight now carries with it a genuine grudge element – and this one has not been created or manufactured merely to sell tickets. Wilder could instead end up facing Tyson Fury next, and even Fury (himself no stranger to controversy) was moved to condemn Wilder’s words. Let’s wait and see if Wilder apologises to Breazeale and whether or not he grants the once-beaten contender a shot at his title. One thing is clear, Breazeale would train like never before in an effort to try and make Wilder pay for his bad words.